Yep, since I’ve been such a slack blogger lately, today you get not one post, but two! Ugh! So many to choose from! Let’s see if I can narrow it down at least a little bit. Splintered by A.G. Howard – I adored this entire series. Such a crazy and interesting take on Alice in Wonderland. I was sad to see the series end. Eleanor & Park by Rainbow Rowell – This book. My heart. SO GOOD! I need to get a review up on this one, just to make sense of how I feel about it. Clockwork Princess by Cassandra Clare – This was the end of the Infernal Devices trilogy, and oh the feels! It was such a perfect ending. Comes the Night by Norah Wilson & Heather Doherty – I got this book for free somewhere. I can’t even remember where, but it was so good! I wish the next book in the series would hurry up and get here! Shadowbound by Dianne Sylvan – My all-time favorite vampire series, this was book five and so many things happened! Let’s just say that I need book six like now! Dreams of Gods & Monsters by Laini Taylor – This entire series was magical from the very beginning. This was a beautiful and bittersweet ending. The Night Circus by Erin Morgenstern – I knew as soon as I started reading this that it would become one of my favorite books, and I was right. I wanted to read it again as soon as I was finished. Blackout by Mira Grant – My first foray into zombies was the Newsflesh trilogy and I enjoyed it way more than I thought I would. It was really hard to put down. The Fault in Our Stars by John Green – So much has been said about this book. It is absolutely beautiful and heart wrenching. I really need to see the movie at some point, but I’ll need a whole box of tissues and a pint of ice cream. Ready Player One by Ernest Cline – This book is just plain awesome. If you like video games, dystopian stories, and a whole lot of 80s trivia, this book is for you. So there’s my list. 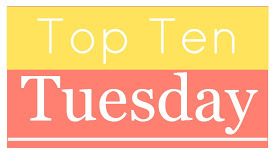 Please leave your top ten posts in comments! Thanks! I really liked your list too! I have Night Circus in my TBR. I hope to get to it soon. Thanks for the recommendations! I tweaked the prompt a bit. Here’s my TTT! I love a lot of the books in your list. Eleanor & Park, The Night Circus, TFIOS. I read the first of Dianne Sylvan’s vampire books but haven’t gotten to the rest. I’ve been reading her blog forever and loved all her nonfiction. I love Dianne Sylvan’s The Body Sacred. It’s probably my favorite of hers, although I love her vampire stuff. You should read the rest of them when you get a chance. Eleanor and Park & The Fault in Our Stars are both such good books! Great list! Yes, I absolutely loved both of those. Thanks for stopping by! Great list! I just finished Eleanor & Park — I agree, it’s amazing. I was crying at the end. So unbelievably riveting. I couldn’t put it down. So glad to see so many lists with The Night Circus this week. It’s such a fantastic book and one whose world I wish really existed. Great choices! It really is one of my all time favorite books. It’s so unique. I haven’t read anything before or since that has the same feeling as The Night Circus does. I really enjoyed reading The Fault in Our Stars and it almost made my TTT post this week. Loved that book. It was so much fun! Eleanor & Park is a very special book. It warms my heart! Warms the heart – and then rips it to shreds. I was a mess after I was done reading it. In a good way, of course.